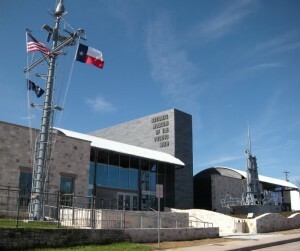 On Saturday, April 6th at 1:30 pm in the historic ballroom of the Admiral Nimitz Museum, the author of For Crew and Country: The Inspirational True Story of Bravery and Sacrifice Aboard the USS Samuel B. Roberts , John Wukovits along with veterans who served onboard the USS Samuel B. Roberts, DE-413 will be present to talk about his book and the experiences of the veterans that were part of the crew. For Crew and Country tells of the most dramatic naval battle of the Pacific War and the incredible sacrifice of the USS Samuel B. Roberts, DE-413. At 1:30 pm author John Wukovits will talk about what inspired him to write this story and the input he has had from the crew and their family members. Following John Wukovits guest will hear first from those who were at the Surigao Straits, and their courageous David and Goliath battle with the Japanese fleet. The program will end with a Q & A session with those in attendance. For Crew and Country books will be available for purchase at the program with an opportunity to have them autographed by the author and those who lived the story. This program is open and free to the public. If you have any questions about the program or book please contact Helen McDonald at 830-997-8600 ext.206 or by email at mcdonald@nimitzfoundation.org.